If you are suffering and searching for that magic Achilles tendonitis treatment, I so feel your pain. I developed Achilles pain during marathon training. It was my first marathon and I was so focused on the training that I felt that I didn't have time for an injury. The last thing you want to hear is "Take some rest days". Us runners are notoriously stubborn and sometimes obsessed so several rest days can cause major panic. The good news though, is that you can get over Achilles tendonitis. And if you nip it in the bud early on, your training might not suffer at all. Achilles Tendonitis or Achilles Tendinosis? You may have heard both the terms Achilles Tendonitis (also known as Achilles tendinitis) and Achilles Tendinosis. It is actually important to distinguish between the two terms as the treatment is different. 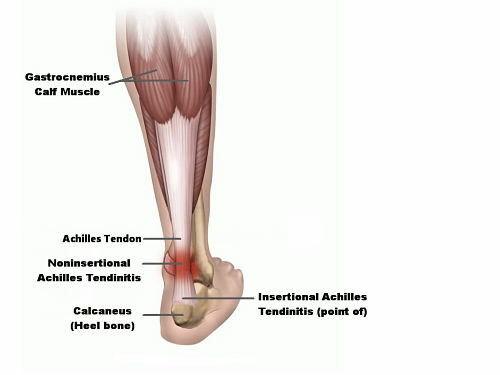 Achilles tendonitis means inflammation (-itis meaning inflammation in medical terms) of the Achilles tendon. The inflammation is usually caused by tiny little tears in the tendon due to overuse. If not treated correctly, then it could turn into Achilles tendinosis (see below). Achilles tendinosis on the other hand is a chronic degeneration (-osis meaning disease process) of the Achilles tendon due to continued overuse and not allowing the original tendinitis to heal. The Achilles tendon is the largest tendon in the body and it connects your calf muscle to your heel bone. It is pretty strong and it has to be when you consider it is used all day every day for walking, jumping and running. If we repetitively overuse the tendon for example by upping our running mileage too quickly, having poor running form, over striding, having tight calf muscles or not getting used to new trainers slow enough, then the tendon is going to feel the strain. INSERTIONAL Achilles tendonitis is inflammation at the point where the tendon attaches to the heel bone. NONINSERTIONAL Achilles tendonitis is inflammation in the middle portion of the tendon. A niggling soreness in the back of your heel either when walking or running. Soreness at the back of your heel when you first get out of bed in the morning. Possible swelling or increased thickness of your tendon. If you pinch the tendon, it feels sore. You may notice a bony lump on your heel. This is called a bone spur and is a piece of calcified bone which sticks out and the tendon has rubbed on it. On a side note, if you heard a pop or felt a snap in your heel, it could be a sign of a totally ruptured Achilles so go see your doctor immediately. Stop running if it is affecting your stride and walk home if necessary. Ice the tendon straight away. How to ice correctly. Give your tendon a rest and take a couple of days off running. I'm not one for taking anti inflammatory medicines as I think sometimes a bit of inflammation is good for healing, but take them if you wish. Don't ignore the signs above and if you start Achilles tendonitis treatment early then you'll have a much quicker recovery time. Think about what caused the Achilles tendinitis in the first place and try and sort that out. Was it too much mileage, new shoes, over striding, weak calves, other injury causing poor running form? Start doing eccentric heel drops (see videos below). These have been proven to be THE BEST way to treat your Achilles tendinitis. When you injure the collagen fibres in your Achilles, your body does its best to repair the fibres or to lay down new ones. However these new fibres are generally a bit of a tangled mess. Eccentric heel drops aim to get rid of the tangled collagen fibres by aligning them again as they should be and so encouraging new fibres to be laid down alongside them and in a more orderly fashion. It is normal and in fact good, that there will be some pain during these exercises. However if it is excruciating, then go easy and build up to the heel drops. Do 3 sets of 15 heel drops on the affected leg twice a day for 12 WEEKS. Even if you start to feel better, keep doing them. If after a couple of days your tendon still feels sore, keep off the running and start doing some cross training if you are panicking about losing fitness. This might be swimming, indoor cycle or elliptical bike. Once your Achilles is no longer sore during everyday walking and the morning stiffness has gone, you can start thinking about going back to running. For the first few weeks, don't run on hills and if you have a choice of running shoes, wear the ones with the highest heel drop. Gradually build up the time spent running, starting with 10 minutes and then increasign by 5 minutes every other run assuming that your achilless feels ok.
Keep doing the eccentric heel drops (for a minimum of 12 weeks) and keep icing after each run if there is soreness. Achilles Tendonitis Treatment NOT working? Be patient, hard as it may be. Consider that you may have developed Achilles Tendinosis. Achilles tendonitis takes from a few days to 6 weeks to heal. Achilles tendinosis however can take several months so you really want to avoid that if you can. I developed Achilles Tendinosis and here's how I dealt with it. The other thing to remember, is that the Achilles tendon has been shown to have a relatively poor blood supply so healing is going to be slower than say to an injured muscle. If your Achilles is still bothering you but is improving, try a brisk walk and then progress to an easy jog. However if it feels really sore and affects your gait, then stop and take a few more days off but keep on doing the eccentric heel lifts. If it is just not getting better after a couple of weeks, then this might be the time to see your doctor to get a definitive diagnosis. Your doctor may prescribe physio, cortisone injections, extra-corporal shock wave therapy (ESWT). In fact there are a variety of treatments but do research them carefully and ask around as not everything works for everyone. Which Achilles Tendonitis Treatment Worked for You?